HELP! My Hermit Crab has left its shell! What do I do? A hermit crabs shell serves two purposes: first protection of the soft abdomen and second it prevents dessication (drying out). A hermit crab that has left the protection and life-sustaining seashell home is telling you it’s in distress. Below we expand a bit on these causes. Land Hermit Crabs endure a great amount of stress before reaching the pet store. The harvesting and shipping of hermit crabs is a very inhumane process and the crabs suffer because of it. They then arrive in pet stores, who in most cases, don’t know how to properly care for them. They arrived stressed out, dehydrated and hungry. Then you purchase them and take them home. Now severely physically damaged the hermit crab will often leave its shell to die. 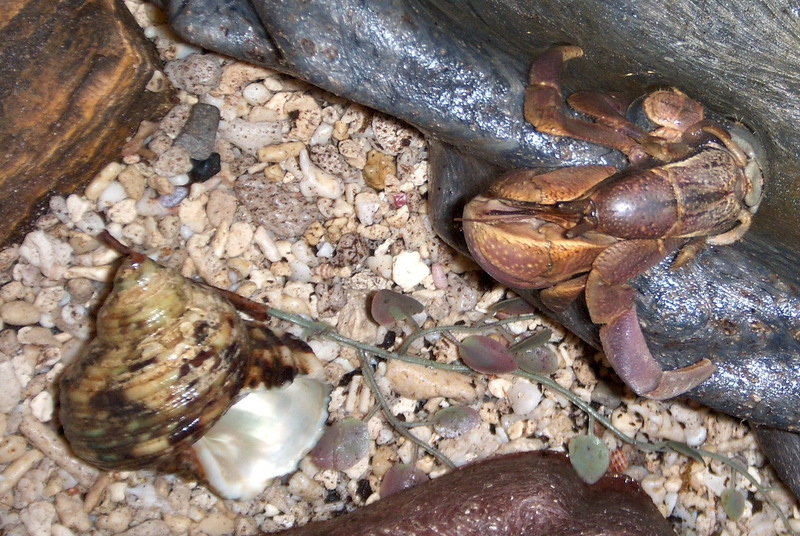 If there is not a variety of appropriate styles and sizes of extra changing shells in the crabitat for the hermit crab to choose from, there may also be shell fights. This is normally dangerous for the hermit crabs within the crabitat due to the fact that hermit crabs would rather let themselves be pulled apart as opposed to giving up their protective home. Many times this leads to a hermit crab being seriously injured or even killed by the aggressive hermit crab in search of a comfortable shell. There are times too when a hermit crab is shell shopping and may of let go of his original shell to try another on and has his shell taken by another tank mate. This forces the hermit crab to find another shell, if a suitable one isn’t available it is left homeless. Something may have got into his shell and is irritating his soft abdomen. One can rinse the shell out with dechlorinated water, but many times if something is lodged within the shell this doesn’t help much. Boiling the shell in dechlorinated water and giving it a good shake will many times dislodge anything that may be within it. There maybe pests or a fungus within the shell that is irritating his abdomen and will cause him to leave the shell. If the hermit crab is too warm, to try to cool off a hermit crab will leave their shells. To prevent over heating it is very important to monitor the substrate temperature as well as the air temperature. The temperature at the warm end of the crabitat should be approximately 80-82F. At 85F or higher this is nearing too warm for most hermit crabs to be comfortable (some species do enjoy higher temperatures). The temperature at the cool end of the crabitat should be approximately 72-75F. Hermit crabs are ectothermic creatures and must have the variance of temperatures to self regulate. If the humidity level is too low in the crabitat hermit crabs feel as though they are suffocating. In hopes of relieving the discomfort they are experiencing they leave their shells. If they had been subjected to a too low humidity, too many times it has already caused irreversible gill damage. For a more accurate humidity percentage reading level, the humidity gauge should be located close to substrate in the middle of the tank away from water sources that can affect the gauges reading. The safe range is 70-80% relative humidity. Cheap analog gauges from pet stores are rarely accurate. A hermit crab will also leave their shell due to a too high of a humidity percentage. A high humidity level makes it difficult for the hermit crab to breath due to the ‘thicknesses’ of the humidity. If subjected to a too high humidity level, this can promote a gill infection that may cause irreversible damage. Maintaining humidity levels of 90% and higher is discouraged. For a hermit crab who has gone naked to surface molt or come up from molt naked and still soft please jump down to the NOTE section. Rinse or boil the shell in dechlorinated water and shake it to remove anything that maybe lodged within it. Pour out most of the water from the shell. Place the shell in the bottom of a cup or small bowl depending on the size of the crab. The container should be JUST big enough for the crab and the abandoned shell. Add a small amount of dechlorinated water the bottom of the cup. This will help keep the crab moist and may help the crab re-shell. If the hermit crab is not in mid molt or still soft from molt, gently pick the hermit crab up by lightly holding it just behind the last pair of walking legs. You can also use a large spoon to scoop him up very gently. Carefully examine the abdomen for any signs of irritation being very careful he does not attempt to escape and injure/kill himself. Examine for any molting symptoms as in transparent eyes, lifting of the old exoskeleton, water sac, etc. Lethargy can be a sign of pre-molt or death. Lower him into the cup next to his shell. Cover the cup with a washcloth to make it dark. Transfer the cup to an isolation unit where the temperature and humidity are within proper ranges OR back into the main tank. Ensure other crabs in the tank are not able to climb into the cup. Leave the hermit crab in darkness and quiet for a while and it may return to the shell. After a few hours if the crab still has not re-shell you can attempt to manually place him back in his shell. If the crab is visibly weak it likely will not be able to hold the shell, if this is obvious do not attempt to manually re-shell. Being very careful and gentle moisten/mist or dip the hermit crabs abdomen with dechlorinated water and try to slide the tip of hermit crabs soft abdomen within his moistened shell making sure it does not scrape or injure the hermit crab. It may be easier to prepare a dish of dechlorinated water, then place both the shell and crab in the water. The buoyancy will make it easier to coax the abdomen into the shell. If the crab will not or can not hold on to the shell do not continue to force. Try a couple of times and then stop. If the crab is still naked you can move to a slightly larger containment area like a small kritter keeper. Add a few more shells that might fit the naked crab to the kritter keeper. Transfer the naked crab and the original shell to the kritter keeper. Offer some honey, worm castings, scrambled eggs or other favorite food to encourage eating. Place the kritter keeper inside of your isolation tank or in the main tank. It is important the hermit crab remain in the correct heat and humidity. If the crab still will not take a shell there is little else to do but keep him comfortable and wait. Continue to offer food and water, maintain humidity and heat. Note: Molting or recently molted crabs should be handled differently. If the crab is still soft or molting, use our 2 liter bottle method (cut off the bottom and place over the crab like a dome) to isolate the crab within the tank. Be aware this does not protect from crabs digging in from below so please keep an eye on the crab. If your other crabs seem overly interested you may need to transfer the crab to a secure container within the crabitat. Use a clean glad ware type bowl with a lid. You can poke holes in the lid. Use a clean spoon or similar scoop to gently scoop up the crab by digging slightly into the substrate below him so that the body is still resting on the substrate and not touching the scoop. Gently place in the bowl along with the most recent shell and one or two other options. Do not add water to this bowl because of the soft exoskeleton. The crab is going to be exhausted and likely will be unable to take a shell until it has fully hardened and regained energy. If the shed exo is available be sure to put it in the bowl along with some water and other foods. Our Hermit Crab Feeding Guide can direct you to the most beneficial foods at this time. If you need any further help, please read the Emergency Help Article.